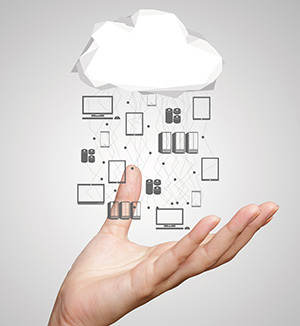 Cloud solutions can drive IT efficiency, improve security, save budget dollars and more. Here's how four higher ed CIOs made the transition at their campuses. During his career, Russell Battista Jr., chief information officer for the University System of New Hampshire, has seen a dramatic shift in how universities approach cloud vendors and software-as-a-service. While he was an IT executive at Yale University (CT) from 2008–2013, he recalled, people were still nervous about moving data off-premise. "During my tenure there, the cloud was not highly adopted and, in fact, kept at arm's length," he said. But by the time Battista moved to Fairfield University (CT) in 2013, where he eventually served as interim CIO, people were getting more comfortable with the concept of student data in the cloud. "People also could see how it was driving efficiencies. We could buy a solution and go live within a month, instead of taking a year to define requirements." When Battista moved to New Hampshire in 2016 to head up IT for the state's four-university system, he was determined to lead a well-thought-out transition to software-as-a-service. "I tell campus IT leaders that it is inevitable. The good news is that it is not going to happen tomorrow. We can plan over the next few years, but the important thing is to take some action now to adapt to this new model." Battista isn't alone in having to do some proselytizing on campus to get both IT staff and other executives comfortable with the cloud. Different CIOs have different philosophies about moving to the cloud, and some tend to be bolder, said Ravi Ravishanker, CIO of Wellesley College (MA). "We want to make sure we are focusing on supporting the core academic mission of the college. Six years ago we began this process, and today we are in the cloud for almost everything." One of the common challenges CIOs face is that somehow the campus community thinks you can provide much better security for an important system like enterprise resource planning (ERP) by running it in-house, Ravishanker said. "As the CIO, you have to accept that this is a flawed argument. I have two people who worry about data and network security. Do you really think we provide better security than companies that have hundreds of people worrying about this? We had this conversation when we went to Google Apps. Google has hundreds of people worrying about data security, including keeping up with current and potential future threats, which we simply cannot afford to do with existing resources." Ravishanker said that for a variety of reasons ERP is one of the most difficult things to move to the cloud, but when it was time to renew Wellesley's ERP system, the college examined its options and decided that Workday, which provides ERP in a software-as-a-service offering, was a viable option. Wellesley began transitioning human resources, payroll and benefits to Workday in March 2016 and went live in January 2017. Finance went live this summer. The college expects its student information system to go live in late 2018 or early 2019. "[Workday] takes advantage of the cloud differently than legacy ERP systems," Ravishanker noted. "When legacy vendors say they are moving to the cloud, they are basically forklifting your on-premise solution or making slight variations to existing code, but not exploiting all of what the cloud has to offer." One of the key differences, he explained, is that a system like Workday has a single code base for all users. It is very much like Google Apps in that sense. Annually the company announces two major upgrades, but every week there are some tweaks here and there, Ravishanker said. The pain of upgrades with the on-premise solution is gone. "We used to have to touch base with every functional office on campus to make sure that they were OK with the dates of upgrades — and we relied on them to do all the testing," he recalled. "In many instances, [those offices] did not have the resources for testing and we would find problems after the fact. It was a big pain. Because Workday is a single code base, the testing in some sense is crowdsourced and you can rely on the user community at large to share the testing." The shift to software-as-a-service also has an impact on the skill sets needed in the IT department. "Most of the work we do in Workday is driven by configuration and business process changes," Ravishanker said. "As a result, the expertise we need to take advantage of the system is less technology and more functional expertise." UNH's Battista agrees, adding that in defining a clear cloud migration strategy, institutions should review what roles are needed in the new process and who will fill them. He emphasized that roles should be defined first, then people assigned to them, not the other way around. "Many higher education organizations say, 'We have this set of people. What can we have them do?' That is the wrong approach," he said. "It is not about getting rid of people. You can repurpose people and maintain a steady-state cost and deliver more value. We can make ourselves more efficient, but we have to define the roles that are necessary and industry standard." He said many colleges and universities fail to ask the right questions about their organizational readiness to change. "You can't just say let's go to the cloud," he said. If you want to migrate to the cloud, you have to plan it out, and have a glide path. It could take one, three or five years, but no IT organization is going to react well if you say we are going to go there tomorrow, Battista said. Battista also noted that adopting cloud services actually makes IT governance more rather than less important. Since it will be critical to review policies and put more formal structures in place when managing the cloud environment, organizations should focus on transparency and building partnerships with business units, he said. The cloud has been an important aspect of the IT transformation at the California College of the Arts (CCA), a small art and design college located in the San Francisco Bay area. "The fact that we are small has made it easier for us to be forward-thinking and take a little risk," said CIO Mara Hancock. "Our institution is accustomed to some risk; as designers and artists, that is part of their work." Like Wellesley, CCA has moved its ERP to Workday and uses Salesforce for student engagement activities. Hancock said these companies use application programming interfaces (APIs) and provide access to the data in ways that IT executives have come to expect in more modern technology. "There is an openness to thinking about things differently and engaging with their customers," she said. "A lot of the old-school ERP companies are still hanging on to a 'walled garden' approach that is not going to last." For CCA's cloud move, it was important to get buy-in from the college's chief financial officer that the cloud strategy was the right one before proceeding, Hancock stressed. The shift to the cloud means that Hancock spends more of her time focused on data integration, middleware and web services management, and it has led to more enjoyable and challenging work for her staff. "They can focus on the journey from prospective student all the way to alumni and build business processes to support that, instead of patching the ERP system or swapping out servers," she said. "Now we can focus on functionality and the business process piece instead of back-end stuff that is not our core business. We shouldn't be spending our time on that." For some CIOs, the cloud provides a lifeline out of a difficult situation and the promise of staying ahead of the curve as technological change accelerates. Bill Britton, vice president of information technology and CIO for California Polytechnic State University, said Cal Poly recently made the decision to get out of the data center business and migrate all its core applications to Amazon Web Services (AWS). He said that when he arrived on campus over two years ago, the university had not done a major refresh of the servers in its data center in seven years. "We did an analysis and a complete refresh of our data center would cost $8 million to $10 million just to bring us up to current standards — not even addressing what future requirements might be," he said. "That is a big chunk of change." Britton said he believes the partnership with AWS will allow Cal Poly to future-proof its approach and have a better chance of staying out in front of the pace of technological change. As an example of the agility the move will bring, he said researchers at Cal Poly would have access to secure high-performance computing and storage on an as-needed basis. "Before, the time to set that up with us in our physical infrastructure was months," he said. "That is now down to minutes." Britton also sees the shift as a win for Cal Poly's IT team, which can work with a more modern technology stack. "No matter how we do this, we still need people to work with our customers. We have people who have been working in the data center and have a lot of knowledge about how the university does business," he said. "We don't want to lose them. We want to transition them to helping customers ramp up AWS capabilities and accelerate a success formula for students and faculty. Staff members who had been working in what we can now call 'ancient technology' are becoming state-of-the-art technologists in how to use the cloud platform. Those skill sets are intriguing to our employees."